Reed's Garden Ramblings: 'Toxic Gardens', What Can We Do To Break The Cycle? An Informed Discussion Of Garden Design, Horticulture, Plants And Many Other Related Topics. 'Toxic Gardens', What Can We Do To Break The Cycle? If we don't do something now we will poison our planet, kill the animals, kill our fellow man and end all life as we know it. We have scientists who have documented the disappearance of Alaskan Glaciers, the suffering of the Arctic Polar Bears, the increasing severity of storms and thousands of other problems that are a result of man's existence on this planet. 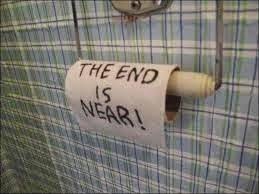 These doomsday sayers and the media love to excite and scare the hell out of people every single day by telling us everything we do is contributing to the death of our planet. That is pretty heavy stuff for a husband and father living in New England. A high school friend posted a New York Times Op-Ed on the 'toxic brew' of chemicals in our yards. While this article does pose some ideas, it is another attempt to scare us into making a change. I continue to be amazed at the socially conscious who believe that scare tactics and promising cancer or compromised endocrine systems will effect any change. We need to provide simple, manageable ideas that busy people can implement easily in their homes and gardens. OK... I agree that we are a major contributor to the planet's problems, but, as a race, are we obtuse or are we just not willing to put in the small effort to improve the health of our environment. I don't know much about changing weather patterns or underweight Polar Bears, but I do know there is a lot we can do in our gardens. While our individual effort may not make a difference, it will be our collective effort that will make a positive change, and really we should do it because it is the right thing to do. While I am not perfect and many people preach that we should use no chemicals, here are some simple ideas to make a difference, though by no means is this an exhaustive list. If you have other ideas that are easy to implement, I would welcome your comment. Number one on my list is that lawn care company that comes by four times a year to fertilize your lawn. You would be shocked to know what is in these formulations, and if you are not using an agronomist or someone who specializes in lawn care, they probably don't know what is going on your lawn either. For a little more money many companies offer organic fertilizers and minimal chemical usage, and if your company doesn't, find one that does. The cheaper the service the more prevalent the use of chemicals. Spend a little more for organic feeding and instead of having them cover your yard in herbicides and insecticides have them only treat areas that are a problem. I have a service that only spot treats weeds that become a problem. Most companies put down a preemergent herbicide every spring over your entire lawn, but most of us know where the crab grass comes in or the sunny spot that gets weedy. If one child gets an ear infection, you don't give everyone antibiotics. Also, insecticides are completely unnecessary in lawns. Almost all of the insects living in lawns are beneficial and when you start unbalancing the insect populations, other insects can start to cause problems. There are some effective and safe products for grubs, which many people have to deal with. Ask your provider for a list of products they are using and choose the better options. If you do it yourself, do some research and be careful about the deceitful use of the word 'organic' and minimize or eliminate phosphate which causes so many problems in the environment. One of the best organic products out there is Milorganite, which has been used safely for years. The point is that you may not know all that is being put on your lawn. Call your lawn care provider and put together a better plan with better products. Is it worth the cost of a night out with the family? 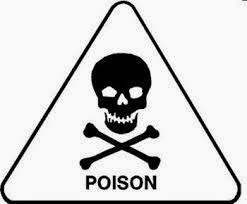 Number two is non-lawn herbicides, insecticides, fungicides and every other 'cide' or chemical used in the garden. Healthy gardens that are managed well, watered properly, pruned carefully and well-loved will have very few insect or disease problems. Fungus issues in lawns, plants and trees are often the result or poor air circulation or too much moisture. The classic is black spot on Roses. If a Rose is in too much shade or gets watered by a spraying irrigation system, it will develop black spot. This applies to all plants, if you put the right plants in the right locations they will be healthy and require minimal care and certainly not require annual showerings of chemicals. 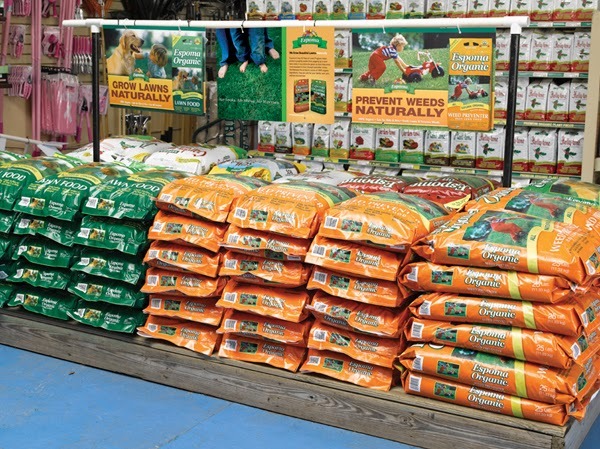 If you do need to provide additional nutrition or additives to your garden, Espoma is a great company that offers all sorts of natural fertilizers and amendments. contractor can leave the clippings. Number three is to mulch grass clippings and let them stay on your lawn. 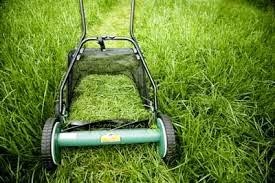 Grass is about 5% nitrogen, so that lowers the amount of fertilizer you need, and as it breaks down it provides organic matter back into your soil. The clippings add moisture and help protect the soil from drying out to quickly. This is easy and you will spend a lot less time hauling around barrels of grass clippings. This is the simplest and best idea for a healthier lawn and your landscaper can do it too. Number four is watering less often and for longer periods. I believe that overwatering is not only costly, but it causes more problems in the garden through disease. Conversely, irrigating for a few minutes every day only allows the water to penetrate a few inches into the soil. This makes the plants send their roots to the surface to retrieve water and not deeper into the ground. The result is plants that are not drought tolerant as they source their moisture at the surface rather than deeper in the soil. The water deeper in the soil from longer irrigation does not evaporate as quickly as surface water and is available for the plants over a longer period. Don't rely on the timer, get out in your garden and poke a few inches down in the soil to see if there is any moisture. Unless I am on vacation, I never turn on my irrigation timer, and I have only watered a couple of times this year. If your irrigation comes on more than once or twice a week, you need to make some adjustments. Also, water in the morning so that the cycle finishes no later than mid-morning. This gets water to the plants before the day starts and allows the early sun to dry leaves which will minimize disease. Plants watered constantly at night will bring all sorts of health problems requiring chemical remediation, while watering during the day is a waste of money and water, as much of the water will evaporate and never get to your plants. Number five is to provide proper care to your plants. Plants that are cited properly (sun and soil quality), well fed and watered, properly pruned (if necessary), will be happy and free of disease. Most times it is plants that are stressed or suffering from disease that attract damaging insects. You can stop this cycle that leads to chemical dependancy by properly caring for your garden. Good plant care companies offer IPM (Integrated Pest Management) programs for people who can't care for or don't know how to care for their plants. Through regular visits, these companies monitor for disease or pests and treat only as necessary to keep the garden in balance and they will inform you if the conditions are not optimal. 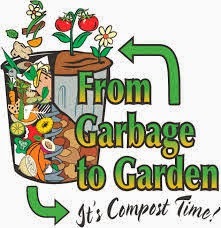 Number six is to compost your food waste for the garden. Sometime soon, I will take this step. With a simple rotating tumbler, mixing in your food waste with broken twigs and brown leaves provides wonderful compost for beds and vegetable gardens. Books are written on how to do this so I won't spend the time explaining. If we could just take these steps, think of the millions of tons of chemicals we could stop producing and letting leach into our water supplies, rivers and oceans. I am not an activist, but we have become so dependent upon these products and services that just aren't necessary. Start by calling your lawn company or buying a safer product if you do it yourself. You don't have to start wearing hemp clothing, eating quinoa or going to the Southern Ocean to fight Whale poachers, just make a few changes in your own yard. Every little bit counts, if not for your own peace of mind and health of your family and pets. Excellent article! My garden is completely organic and we don't use a lawn care company. I also make worm compost in my basement to use in my garden. To avoid buying plants full of neonics, I grew my own annuals from seed this year. 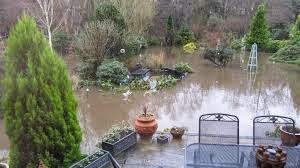 My garden isn't going to save the planet, but it definitely won't make it worse! What's The Right Hydrangea For Your New England Garden(Part 1)? Weeping Japanese Maples Need Pruning To Enhance Their Beauty. Bad Mulch + Lousy Application = Dead Plants! Flowering Dogwoods Are Beautiful And Versatile Trees. Ticks, bugs and disease, Oh my! Ricin And Other Poisons Found In Our Plants. ©2012-2014 Barking Dog Gardens. Watermark theme. Powered by Blogger.